How would you like to go to your fitness center, decide when you get there you don’t feel like working out on the weights, but would rather go one on one with one of your fellow members? Welcome to the OC Dojo Fitness Club, located in the Rancho San Clemente Business Park on Calle Iglesia. In Japan, the term dojo, is used to show a place of learning. At the OC Dojo Fitness Club they offer a variety of workouts and classes that encourage and challenge members to reach a greater level of fitness. Opened in 2005, this is arguably the largest of San Clemente’s workout venues. Housed in one of the newer warehouse facilities, its 8000 square feet boasts lots of open space, leaving elbowroom for everyone. The Club is well staffed with some 15 qualified and dedicated professionals, each bringing their own special talent to the table. Its main lobby is almost Zen-like. One doesn’t get the feeling they’ve entered a gym until they see the boutique and various martial arts paraphernalia. But when passing through the next door, they look right at the boxing ring. Then off to the right they discover a large number of heavy bags, to the left a nicely equipped weight room. And past the ring is a large matted area that serves a variety of purposes. 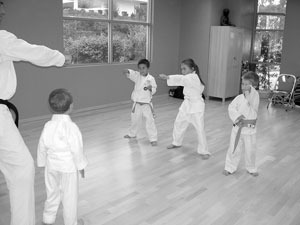 The OC Dojo offers mixed martial arts classes. No one discipline is practiced there. The style they employ comes from a mixture of submission wrestling, Muay Thay (which is a kickboxing style that has found its way here from Thailand), and Jiu Jitsu. In addition to the mixed martial arts, the OCD has specific classes in Muay Thai levels I & II, Submission Wrestling, Jiu Jitsu, and also Brazilian Jiu Jitsu. How about the kids? No problem, they offer afternoon classes where children 12 and under can learn Karate, specifically the Shoalin Kempo style from instructor Ryan Wetzel who has some 19 years’ experience under his Black Belt, that he is happy to share with them. If getting your heart rate up and unloading some pent-up energy is what you’re looking for, the OCD also has cardio-kickboxing. Working out on the heavy bags, should lower anyone’s stress level. Another class Tess recommends is the Strength & Conditioning. This one’s meant to build speed and endurance via two-minute drills using various props. Body Sculpting is a one-hour circuit training class, which according to the program makes use of weighted and non-weighted movements, with a focus on developing killer abs. Got Yoga? Yes they do. Actually there are several different yoga classes to choose from. Yoga in its definition is the mind, body and soul connecting through breathing and movements. One of the forms is Ashtanga Yoga, which means, eight-limbed-yoga. This is more of a power yoga where the body is constantly moving from one position to the next. Another form, the Iyengar, builds the foundation. It corrects your alignment using slower movements with breathing, giving a more isometric exercise. Lastly, there is Vinyasa, this is a mixture of the first two and is a flowing class though not as active as the Ashtanga. The OCD has even installed a special Bo-flex floor to lessen any impact that can effect the joints. Had a rough morning and need to kick-start the afternoon? San Clementean Gabrielle Bassman, Director of Operations and Fitness for the OCD, invites you to come in for a half-hour full body workout. Exercises that consist of aerobic, anaerobic, Pilates, weight lifting, conditioning and toning. All that in 30 minutes, still giving you enough time to eat lunch and get back to work.